Previous post: What and Where are the Howgills? Many of the Yorkshire Dales are named after their rivers. Wharfedale has its River Wharfe and Swaledale the River Swale. 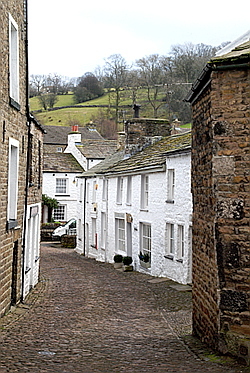 Dentdale, however, takes its name from Dent village, five miles up the River Dee from Sedbergh. In this respect it is similar to nearby Wensleydale which does not take the name of the River Ure but of Wensley village. Dentdale is deservedly popular with walkers. The long distance route, the Dales Way, passes along its length. At Dent village, in the heart of the dale, there is a heritage centre and a beautiful nature trail which combines natural history with information on local crafts, history and traditions. Much effort has gone into presenting to visitors the story of the village’s past. 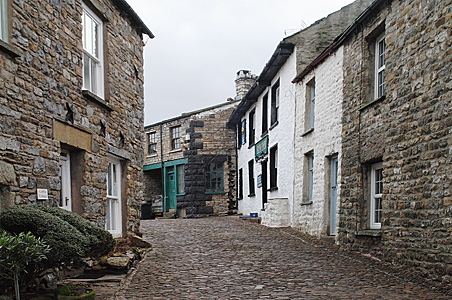 Just like other places in Cumbria and the Yorkshire Dales, Dent village was not built as a tourist attraction. It has a past rooted in the productive lives of many generations of dalesfolk. During your stay at Cross Hall Farm camp site don’t miss an expedition up beautiful Dentdale, which like Sedbergh, the Rawthey valley and the Howgills is administratively in Cumbria whilst also being in the Yorkshire Dales National Park. Long before machines could knit the people of Dent built up an important local industry of hand knitting. Both men and women, young and old, were involved and the Dent knitters became so highly productive, that they earned the sobriquet “The Terrible Knitters of Dent”. The knitting industry has gone, apart from small scale craft work, but descendents of the sheep that produced the wool occupy Dentdale in vast numbers. This is sheep farming country and in Spring the valley resounds with the bleating of lambs, blending with the rippling music of the River Dee. For railway enthusiasts Dent station is special as it is the highest railway station in England; and even better, it is on the scenic Settle to Carlisle line. Although the station is four or five miles further up Dentdale from Dent village it is within the boundaries of Dent parish. Geologists, on the other hand, may connect Dent with the man often credited as the founder of the modern science of geology, Adam Sedgwick (1785-1873), professor of geology at Cambridge in the mid-19th century. 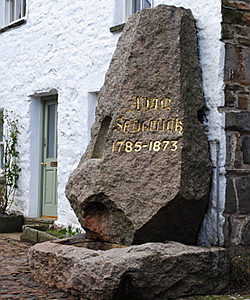 Dent is proud of the fact that Sedgwick was the son of their local clergyman, and there’s a memorial to him in the centre of the village, appropriately for a geologist a large lump of rock. A stay at Cross Hall Farm is scarcely complete without a visit to Dent.